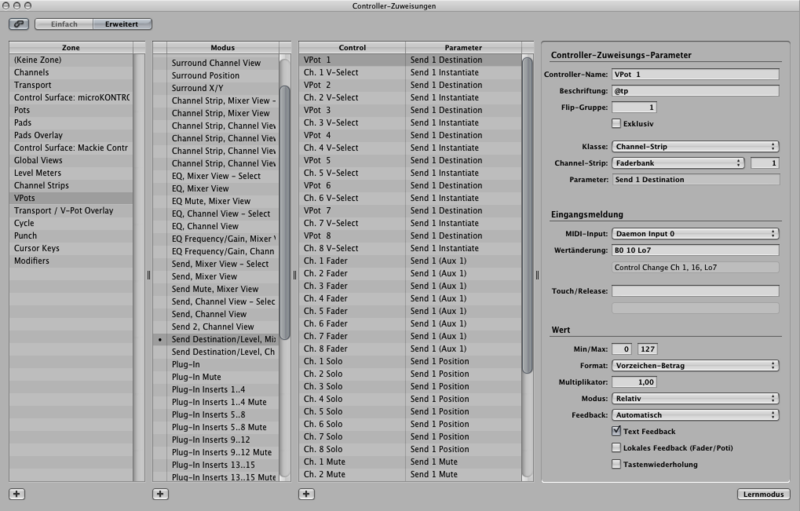 unfortunately it is not possible in logic pro to assign midi controller to dial the available ins, or outs, ob busses to be used by the selected channel. I would find this extremly useful when taking an itb production and spreading it on the console. Or during tracking, to quickly and without a mouse select the input to be recorded from. That would be great, and i keep thinking if maybe there is a workaround to this problem. I fear that this is, if possible at all, not very reliable. -microcontroller running modded logic/macki control software? I am not sure if these controllers can do the trick, if so this could be an option. Can the midibox lc software be used on a midibox that offers only these options? I need no faders, displays, transport functions... Just a dial to select and maybe a couple buttons to switch between ins, outs, busses, and what would be cool, also if itÂ´s stereo or mono outs. maybe a Midi Controlled Mixer would do this for you. In Hardware or in Software like on the Soniccore. MC/LC protocol doesn't give direct access to the parameters. INs/OUTs, Busses, etc.. can be changed, but only with a user interaction which is (almost) impossible to automate. So, maybe an alternative proposal: have you ever worked with the controller assignment page?